Located on the west coast of Vancouver Island close to Tofino this Provincial Park is accessible by boat from Tofino. 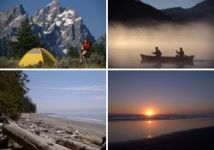 Wilderness camping is allowed and in spring it is known for its wildlife viewing of Gray whales on their way to their summer feeding grounds. Beware of wolves.